Sony shows Gran Turismo on a 19-inch FED Display with 240 fps! Sony shows a playable demonstration on a 19 inch FED Display (Field Emissions Display) developed by Sony, with a frame rate of 240fps (240 frames per second). 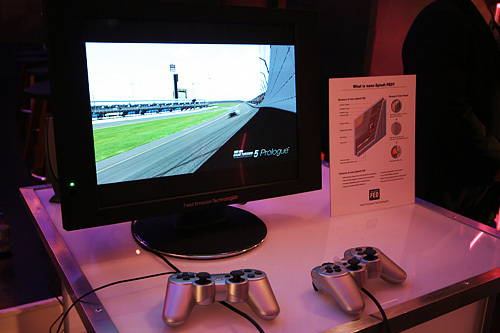 Gran Turismo 5 Prologue has already achieved a frame rate of 60p (progressive), but in this demo, Gran Turismo was made playable at four times this frame rate at 240fps. The display used in this demonstration was the 19 inch nano-Spindt FED screen produced by FE Technologies, who is a company that has taken over the development of the FED technology that was being developed at Sony. This display contains over 10,000 electron sources called the nano-spindt emitter, per pixcel. FED’s prowess is based on methods very similar to the cathode ray tubes (CRT) used in old TV sets, in that electrons trigger the individual pixels to light up. The difference is that CRT sets use an electron gun to scatter the charged particles, whereas each FED pixel has its own corresponding electron source. Field Emission Technologies plans to ship a line of high-end professional FED video monitors in 2009, said Norihito Nishimoto, a spokesman for the new company. The monitors will be offered in a range of sizes up to 32 inches, he said.